Not sure If you'd read any of my humorous articles yet. While the rest of the world goes about its regular business of being choked, poisoned slowly, and drained of all its resources by the evil energy and oil companies, scientists have been busy trying to save us all by developing a novel new way to power our small personal electronic devices. We all know that the power for these myriad addictively hypnotic devices is supplied by a literal evil empire full of dark lords bent on our captivity and destruction, nevertheless, we just can't seem to live without them. This need threatens to further enthrall us all, so the apparent question we're faced with here is this: How do we satisfy our obsessive need for personal cyborgism without allowing this evil empire to gain yet more control of our lives? The revolutionary new flexible biomechanical energy scavenging Piezoelectric Nanogenerator! This ingenious little device was developed by Georgia Tech researchers, who discovered that mechanical energy could be harvested by inserting tiny power generating nanowires into a flexible surface. Simply put: the power is generated by the flexing of the material. Although this ultra advanced technology is still only in its infancy, Dr. Zhong Lin (ZL) Wang has so far developed it all the way from a barely present yet provably demonstrated piezoelectric effect on nanoscale nanowires to a working flexible generator that can produce enough power to run small devices while being driven by... a HAMSTER. one of our cute little furry friends, put it on a wheel, and generated power. At present, not much power is produced in this manner, but Dr. Wang seems certain that advances in materials and device efficiency will soon boost power production enough to make this form of biomechanical power feasible. We can almost hear the greedy energy mongers salivate as they lie awake dreaming of row after row of enslaved hamster wheel driven generators stretching off into infinity. But let's not give them credit for being that easily satiated, there's surely more to this than the simple desire to exploit hamster power. Turns out that there may just be. We will soon be able to 'stick it to the man' by literally sticking it in ourselves! Now I'm not certain if Dr. Wang or his fellows realize this or not, but he is talking about developing a potent new source of power directly within smelling distance of the most evil industrial empire in all of known history. This cabal seeks to keep its grasp on our lives and pockets, then kill us, and you can bet they aren't going to allow anyone to stick anything to them anywhere they don’t want it stuck. Whatever future we imagine for us, you can veritably rest assured their idea of it based on this new technology looks far less like glorious-glowing-electric-cyborg-jellyfish-monkey-man-complete with power outputs, but something more like either a scene out of The Matrix, or this. So get ready to climb your fat asses on that wheel Mr and Ms Long Hamster, you will soon be a human battery for the most evil empire yet. It is after all your destiny. Consider that as you obliviously whiz down the highway, texting away. There is some damn funny stuff in almost every other thread on this bbs. I wish he could seperate the Funny from the serious even though both are always often within the same post. There are dry humourless forums out there... somewhere. Keith's example humorously writes itself a reality check Lincoln can cash! I bet Lincoln still wouldn't get it. Phys.org)—In an attempt to harvest the kinetic energy of airflow, researchers have demonstrated the ability to harvest energy directly from the vibrations of a flexible, piezoelectric beam placed in a wind tunnel. While the general approach to harvesting energy from these "aeroelastic" vibrations is to attach the beam to a secondary vibrating structure, such as a wing section, the new design eliminates the need for the secondary vibrating structure because the beam is designed so that it produces self-induced and self-sustaining vibrations. As a result, the new system can be made very small, which increases its efficiency and makes it more practical for applications, such as self-powered sensors. Read more at: [url=http://phys.org/news/2015-07-scientists-harvest-energy-self-induced-self-sustaining.html#jCp]http://phys.org/news/2015-07-scientists-harvest-energy-self-induced-self-sustaining.html#jCpNO MORE Evil Energy Empire !!! Keith's example humorously writes itself a reality check Alemos can cash! (Phys.org)—A pair of researchers at Liverpool John Moores University in the U.K. believe they have found a way to measure happiness in hamsters. In their paper published in Royal Society Open Science, Emily Bethell and Nicola Koyama describe behavioral studies they carried out with hamsters, what they learned and why they believe their results indicate that hamsters, like other mammals, have feelings, or moods. Anyone who has ever owned and cared for a pet hamster has faced the same problem—knowing if the creature is happy, or at least content with its living arrangements. Hamsters don't offer much in the way of feedback and because of that Bethell and Koyama looked to see if there might be any other ways to measure their "happiness" level, such as by using what scientists call judgment bias—where an animal (including humans) will tend to behave more optimistically when they are feeling good emotionally. Such studies have been conducted on many species, but not with hamsters. The new study consisted of training a group of 30 hamsters to associate water bottles placed in a certain locations in their cage with sugar-water, which the hamsters really like, in some places and bitter quinine, which they hate in other areas and then dividing the group into two—half of the group were transferred to really nice cages, with chew toys, wheels, nice wood chips underfoot, etc. The other half lived a much more austere existence. Then, the researchers added more bottles to the original cage, some with sugar-water, some with quinine and others with plain water, and then tested how all 30 of the hamsters reacted. The thinking was that happy hamsters would be more open to testing the new bottles to see if they held something sweet. Sure enough, the hamsters that had been living the good life were much more receptive to trying all the other bottles, while those, presumably less happy with their recent abode, moped and mostly only sipped at the bottles they knew would offer a sweet reward. The study doesn't prove that half of the hamsters were actually happier or sadder, but it does appear to show that hamsters do better when living under better conditions, which, in retrospect, likely doesn't come as a surprise, because who doesn't? Recent developments in the study of animal cognition and emotion have resulted in the 'judgement bias' model of animal welfare. Judgement biases describe the way in which changes in affective state are characterized by changes in information processing. In humans, anxiety and depression are characterized by increased expectation of negative events and negative interpretation of ambiguous information. Positive wellbeing is associated with enhanced expectation of positive outcomes and more positive interpretation of ambiguous information. Mood-congruent judgement biases for ambiguous information have been demonstrated in a range of animal species, with large variation in the way tests are administered and in the robustness of analyses. We highlight and address some issues using a laboratory species not previously tested: the Syrian hamster (Mesocricetus auratus). Hamsters were tested using a spatial judgement go/no-go task in enriched and unenriched housing. We included a number of controls and additional behavioural tests and applied a robust analytical approach using linear mixed effects models. Hamsters approached the ambiguous cues significantly more often when enriched than unenriched. There was no effect of enrichment on responses to the middle cue. We discuss these findings in light of mechanisms underlying processing cues to reward, punishment and true ambiguity, and the implications for the welfare of laboratory hamsters. The major consumption of corn leads to infanticide among the Great hamster, a rodent threatened in Alsace, according to a recent study highlighting "problems related to monoculture"
A diet of corn is turning wild hamsters in northeastern France into deranged cannibals that devour their offspring, alarmed researchers have reported. 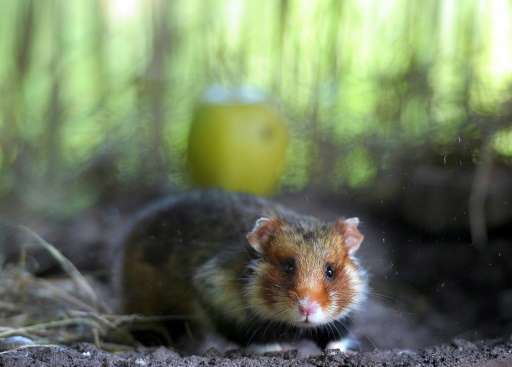 "There's clearly an imbalance," Gerard Baumgart, President of the Research Centre for Environmental Protection in Alsace, and an expert on the European hamster, told AFP on Friday. "Our hamster habitat is collapsing." The findings, reported last week in the journal Proceedings of the Royal Society of London B, finger industrial-scale monoculture as the culprit. Earlier work had looked at the impact of pesticides and mechanised ploughing, which can destroy their underground homes, especially during hibernation in winter. "Females stored their pups with their hoards of maize before eating them," the scientists reported. "Pups were still alive at that time." The cannibal mothers showed other signs of abnormality. The usually cute-and-cuddly hamsters ran in circles, "climbing and pounding their feeders," when scientists entered the room. The females also had swollen and dark tongues, and blood so thick it was difficult to draw for samples. The researchers recognised the symptoms, and had a hunch as to what was causing them. Pellagra is thought to have decimated some three million people in North America and Europe from the mid-18th to the mid-20th century. 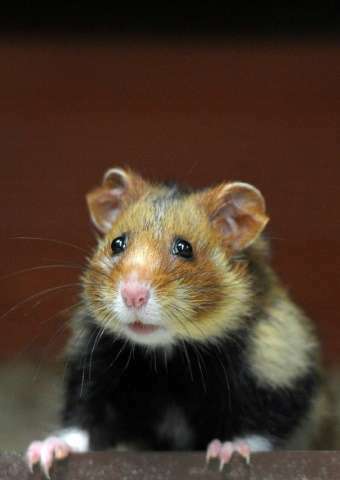 Tissier and her colleagues thought of a simple way to find out if their corn-crazed hamsters were suffering from a similar condition. In a second set of experiments, they offered hamsters corn-based diets, one of them with B3 added. Sure enough, the vitamin-enriched diet was enough to eliminate the horrific symptoms, and prevent the female hamsters from eating their young. The dire consequences of the B3-deficient corn diet, the scientists concluded, stemmed not from reduced maternal hormones, but rather a change in the nervous system that induced the same "dementia-like" behaviour diagnosed in humans. "Knowing that these species already face many threats, and that most of them are in danger of extinction, it is urgent to restore a diverse range of plants in agriculture schemes," the researchers urged. Baumgart, who has been fighting for years to protect the endangered rodents, agrees. "Monoculture in agriculture is really bad for biodiversity," he said. "Now we need to take concrete action." Holy smokes ... that is just gruesome. killing small animals by asphyxiation. and dried out entire grasslands. Quote: One day his air conditioning stopped working. A musty smell seeped from the vents in his living-room floor. So he powered up his Shop-Vac to clear them. By the time he was done, he’d sucked out five gallons of ants. Mike laid out poison, generating more heaps of dead ants. But new ants merely used those dead ants as a bridge over the poison and kept streaming inside. “They literally come in waves of just millions,” Mike told me. frantic networks of ants zipping around the kitchen floor in all directions. Mike took off the back panel and found the guts throbbing with ants. He got rid of the television. that they looked like discarded coffee grounds. have estimated that invasive species cost the nation $120 billion a year. and fortify the native ecosystems they trample.